15 years ago, before the age of YouTube and easily available online videos, BMW took up a big project called BMW Films. The series it produced, called The Hire, focused on Clive Owen as a getaway driver in a new BMW vehicle. These were basically the precursors to the long-form commercials we know today, but The Hire was actually focused on storytelling, and all desire for viewers to drive the cars featured were more based on the performances they made as opposed to because of flashy glamour shots and specs. The videos did extremely well, and the series lasted for two seasons, or eight videos. 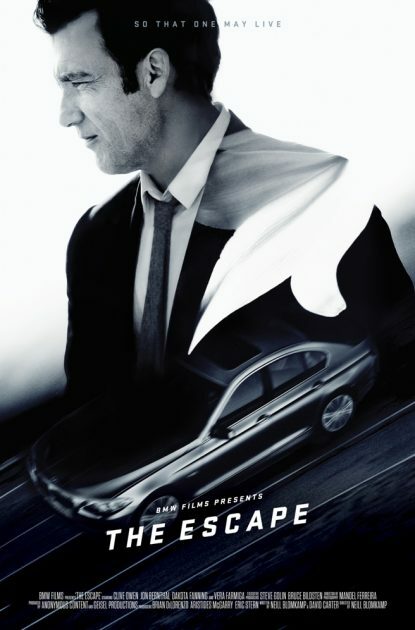 This month, BMW Films finally released its latest short film, The Escape, on its own website and YouTube. It brings back Clive Owen’s driver, and he is joined by stars Dakota Fanning, Jon Bernthal, and Vera Farmiga in a story that takes place in a futuristic American city. Since the movie is only about 11 minutes long before credits, to tell you anything else would spoil the experience. Watch it for yourself below. We have to say that this film is absolutely gorgeous, with great cinematography and action in the much extended car chase scene. It was also appreciated that the filmmakers (and BMW) didn’t shy away from doing damage to the all-new 2017 BMW 5 Series sedan (although it still managed to keep most of the body intact). On the other hand, it certainly seemed as if this installment was more focused on the car than on the humans inside of it, but the story was still compelling and interesting. The Escape is a great short film, but it leaves us with many questions. What happens to Dakota Fanning’s character and the doctor? Are they still hunted? How did the doctor meet The Driver? I guess we’ll never know, unless BMW Films continues the series, or makes a future-length feature. We would be 100% behind the automaker, no matter which path it chooses.